Who Brought Home the Pickles??? Our own local SW Club team rose to the challenge and defended the St. Cloud Challenge Pickleball Bowl!! The score was a very close 7 to 5 and our brilliant team included Jackie Faegre, Adriana Astbury, Bob Korn, Dennis Gallaher, Tom St. Aubin, Bridget McMullin, Laurie Hynes, Tracy McKibben, Jim Rennich, Beth Burgan, Jeanette June and Bob Campbell. Great job team! It was another epic duel between two friendly adversaries – the SW Metro Pickleball Club and St. Cloud’s Northern Paddles Pickleball Club! A huge thanks to Northern Paddles for making the trek down to the city on a rather gloomy, rainy day. Players scrambled to find an indoor facility and thankfully Champions Hall was available, where the players battled it out. The celebration continued at the SW Metro Club picnic by beautiful Lake Riley. 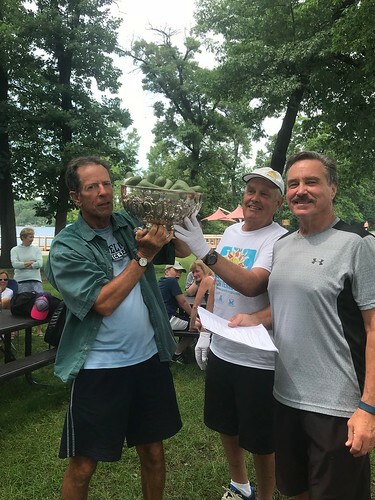 The gloom dissipated so chefs Doug and Tom cooked up the burgers and hot dogs and the prestigious Pickle Bowl was awarded to Dennis Gallaher on behalf of the Club. There’s no such thing as too much Pickleball, so fun play continued up at the courts. The Northern Paddles Pickleball Club will be hosting us in September to try to win back the Pickle Bowl so let a Board Member know if you’d like to play. Paddles up for the Picnic committee – Dianna St. Aubin, Barb Sharpe and CJ Williams – many thanks!! NOW OPEN! FOUR NEW PERMANENT COURTS AT PIONEER PARK. Four freshly surfaced and painted new permanent pickleball courts are now ready to play at Pioneer Park behind the Eden Prairie Senior Center, just off Eden Prairie Road and Pioneer Trail, 8940 Sutton Drive, Eden Prairie, MN 55344 . The courts have been resurfaced to make them harder so the bounce is better. Give them a try and let everyone know. Four of 39 new courts now open, 35 to go! Have fun! Volunteering at a Bangkok English School this past March gave us an opportunity to play pickleball in the heat and humidity of Bangkok! It was over 90 degrees when we played! The minister from Minnesota who started the Santisuk Church and English school was introduced to pickleball when visiting Minnesota a number of years ago and decided to convert their small parking lot to 3 pickleball courts on weekends. Space is a little tight but they make it work! 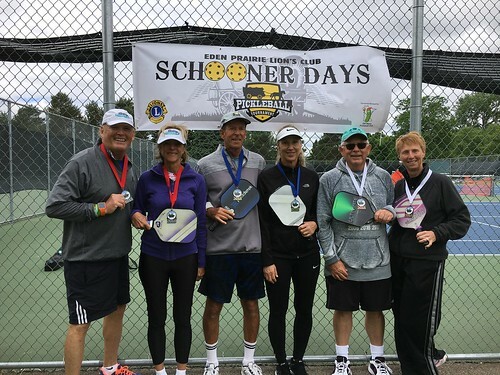 They even had a pickleball tournament this past April and had many teams from India compete. Click HERE for more information about their school and Pickleball program. “We are the only place in Thailand developing excellent Thai pickleball players, with many at the 4.0 level or higher”. One of our primary Club goals is to expand capacity and quality of playing venues. So it’s a great year with 39 new dedicated courts showing great progress in Eden Prairie, Bloomington, Minnetonka, Hopkins, and Golden Valley. Pioneer Park will also get a new overlay and four permanent courts. Eden Prairie Staring Lake Park: the eight new courts are now paved and fences, net posts and drinking fountain installed, way ahead of schedule! Maybe playable in July? Bloomington Westwood Park: eight courts are now approved with groundbreaking expected in late June and completion in late Summer. A new tennis court will be lined for four additional temporary courts. Minnetonka Lone Lake Park: eight dedicated courts are now mostly graded with more earthwork in progress, hoping to be playable later in the Summer. Hopkins Central Park: five new dedicated courts being graded now and expected to be completed this Summer just off Excelsior Blvd on 16th Avenue South. Golden Valley Wildwood Park: the asphalt is down for six dedicated courts located at Duluth St and Pennsylvania Ave. With some luck, we should be playing by July 1st. SouthWest Metro Pickleball Club is pleased to announce a partnership with Michael Lynne’s Tennis Shop a local premiere Tennis and now Pickleball shop. While relatively new to Pickleball, Michael and Mimzy Lynne have been in the tennis business for over twenty years. In that time, they’ve learned what customers really want: expert advice, a great selection, and most of all, unmatched customer service. And that is exactly what they are now bringing to Pickleball. When you visit the store, you won’t find soccer balls, blenders or bicycles. What you’ll find is the region’s biggest selection of Pickleball equipment and apparel in a location staffed by friendly, helpful employees who know and love the game just as much as you do. Or visit their website and then head to the store! Stop by and mention you are from the SW Metro Pickleball Club and welcome Mike and Mimzy to our Pickleball Community! Ask about their DEMO program. It’s a great way to try before you buy! JOIN US FOR A PICKLEBALL PICNIC!! Food, fun, friends, family and pickleball! Bring your family and join us at Riley Lake Park and courts on JUNE 16 for the SW Metro PICNIC by the lake! During the picnic our club will be hosting this year’s SWMetro vs. Northern Paddles (St. Cloud) Pickleball Challenge. Come support your team! SW Metro Pickleball Club provides food and soft drinks, so bring a chair(s) and your paddle (for play after the Challenge). There will be yard games for all to enjoy! Let the fun begin! !